The current Dubai Zoo has been crammed into a 1.5 hectare space for several years. It holds hundreds of animals, including Eastern lowland gorillas and chimpanzees. 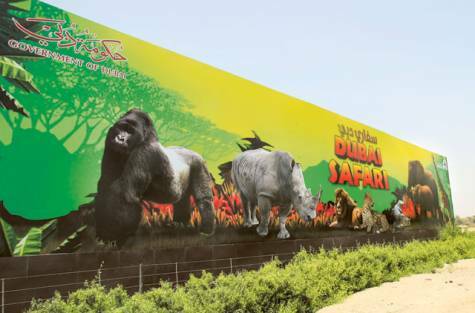 The zoo will be moving to a new 120 hectare plot of land and expanding into the Dubai Safari Park. The Safari Park will have four sections, African, Asian and Arabian Villages and an open parkland for animals coming from different geographical locations, with an architecture and landscaping to match. Will the new Dubai Safari Park import illegal great apes? The new safari park will no doubt need new animals to stock its huge expansion. What species will they be? Where will they come from? Will they be imported following CITES regulations? We ask those questions because the current Dubai Zoo has two Eastern lowland gorillas, named Digit and Daina, but the CITES Trade Database shows no gorilla imports since 1990, the year the UAE joined CITES. Were they imported prior to 1990? PEGAS hopes to answer the questions, particularly in regard to great apes, in the coming months. This entry was posted in UAE and tagged Dubai Zoo, safari park. Bookmark the permalink.